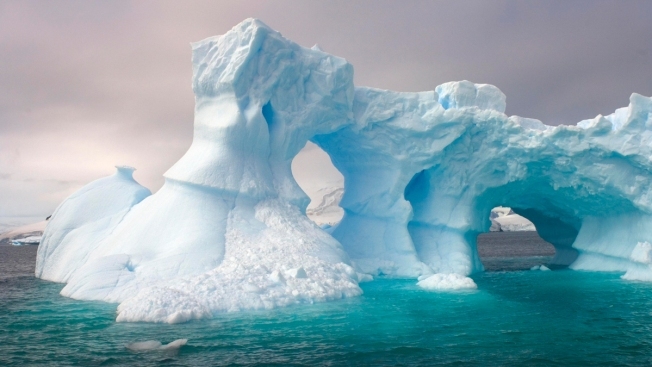 An arched iceberg floating off the Western Antarctic peninsula, Antarctica, Southern Ocean is shown in this undated file photo. A Middle Eastern firm has plans to tow icebergs to the world's most water-starved countries to supply drinking water. Some of the world's biggest cities are facing a shortage of drinking water, but an engineering firm in the Middle East is moving to try to fix that by towing icebergs from the Antarctic to the world's most water-starved regions, NBC News reported. The United Arab Emirates-based firm, National Adviser Bureau, plans to begin a pilot in November, using satellite imagery to find a suitable iceberg. They'll then lasso it with nets and chains and use a small flotilla of boats to tow it roughly 4,000 miles to either Australia or Africa. If the effort succeeds, the water will be sold to a government. The firm's founder, Abdulla Alshehi, said he has his eyes on icebergs that measure about 2,000 feet by 7,000 feet, and weigh around 100 million tons. He's tight-lipped on how, exactly, water from the icebergs would be obtained and distributed, but the general plan is to crush the iceberg bit by bit while it's still offshore. It would then be brought to shore and purified.